Here's the smell of the blood still. All the perfumes of Arabia will not sweeten this little hand. Oh, Oh, Oh! In Saudi Arabia people die in grisly ways every day of the week, but, as I said on Wednesday's John Oakley Show, a chap such as Jamal Khashoggi, a deep-cover spook and former confidant of the highly sinister Prince Turki, does not get whacked except on orders from the very highest in the land. By "very highest", see the two fellows at right. So Friday's formal Saudi announcement that yes, unfortunately Mr Khashoggi was indeed questioned to death in the Istanbul consulate but only by minions gone rogue was inherently risible. Nobody goes rogue in Saudi except for occasional senior princes who think they should have been king. Four members of the Khashoggi hit squad accompanied Crown Prince Mohammed bin Sultan on his visit to London in March for a round of meetings with the Queen, the Prince of Wales, the Duke of Cambridge and Theresa May. But we're expected to believe that MbS's entourage took it upon themselves to fly to Istanbul and chop this guy up. 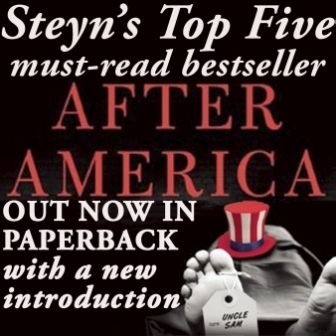 The butler did it - and, to modify the Nazis, they were only not obeying orders. So nothing to worry about. I tried to get out of that, every week. I thought of myself as the DH in the American League. I said, stay out these sketches because you're always going to be the fourth-most effective guy in the sketch. To the casual observer, Mrs Warren, now the Democrats' Senate candidate, might seem a 100 per cent woman of non-color. "People who are like I am" - that's to say, 1,023 one-thousand-and-twenty-fourths white. 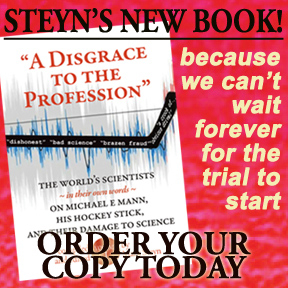 Gee, why isn't there a club for that at Harvard Law School? Only in America does the nation's most prestigious law school hire a 100 per cent white female as its first 'woman of color' on the basis that she once mailed in the Duke of Windsor's favorite crab dish to a tribal cookbook. If the House of Windsor is now one of the five tribes, all America has to do is restore the monarchy, and the Queen will be your first 'woman of color' in the Oval Office. Again, that should be 99.9 per cent white female. Before he ascended to the throne, the Duke inspired a hit song of reflected celebrity: 'I Danced with a Man Who Danced with a Girl Who Danced with the Prince of Wales.' That seems to be how Harvard Law's identity-group quota-filling works. I'm confident that, if this issue re-emerges during Elizabeth Warren's campaign to be the first Native-American president, she'll be able to prove she danced with a man who danced with a girl who danced with someone who once changed planes at a municipal airport accidentally built on a Cherokee burial ground. ~A little over - gulp - twenty years ago, I got a call from Conrad Black and then from Ken Whyte and, without giving much thought to the matter, agreed to write for their new Canadian newspaper. 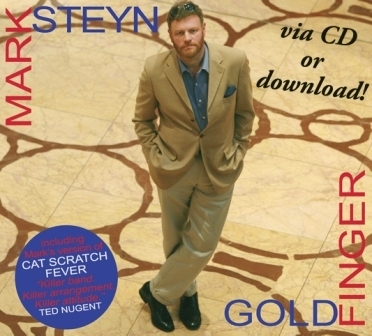 The National Post hit newsstands at the end of October 1998, and all next week SteynOnline will be marking the occasion with some favorite - or even favourite - pieces from my years with the paper. As I always say, it was the great journalistic adventure of my life. Conrad and Ken brought together a terrific team, from the deputy editor Martin Newland to star columnist Christie Blatchford to parliamentary wag Paul Wells. Conrad wound up (totally unjustly) in a prison in Florida, which is pretty grim, and Ken wound up as Senior Executive Vice-President (Digital Synergization) of something or other at Rogers, which sounds even grimmer, and the rest of us are scattered to the four winds. But for a brief time the Post was a shot in the arm for the moribund Canadian newspaper scene. Conrad's ownership improved not only his own papers but rivals such as The Globe And Mail, which was a better paper for having had to compete for the first time in years. Don't get me wrong. Chrétien's Canada is not Pinochet's Chile. If it were, our economy would be in better shape. Besides, I'm sure our pepper spray isn't like Chile pepper spray. Canada's much-vaunted niceness is smug and suffocating, but it's our national characteristic. It's what all those National Lampoon non-jokes boil down to: 'How do you get 40 Canadians into a phone booth?' 'You say, "Pardon me, but would you please all go into the phone booth?"' Etc. The truth is it requires a vast panoply of restrictive legislation to shoehorn us in: Canada's 'niceness' has always been somewhat coercive. It's not just anti-totalitarian demonstrators being denied the right to protest, but also fellows like that Mayor of Fredericton, forced by New Brunswick's Human Rights Commission to proclaim officially the city's Gay Pride Week. Canada's famous 'tolerance' has become progressively intolerant. It's no longer enough to be tolerant, to be blithely indifferent, warily accepting, detachedly libertarian about gays – as the Mayor and his electors were. For tolerance is, by definition, somewhat grudging. Instead, gays must be accorded official mandatory fulsome approval, no matter that enforcing Gay Pride means inflicting Straight Humiliation on a hapless mayor and displaying a cool contempt for his electorate. As the Queen put it a couple of Canada Days back, 'Let us celebrate the unique Canadian ability to turn diversity to the common good.' But the uniquely Canadian thing about 'diversity' is the ruthless uniformity with which it's applied. Start as you mean to go on, I say. There's been a lot more of that in the last two decades. 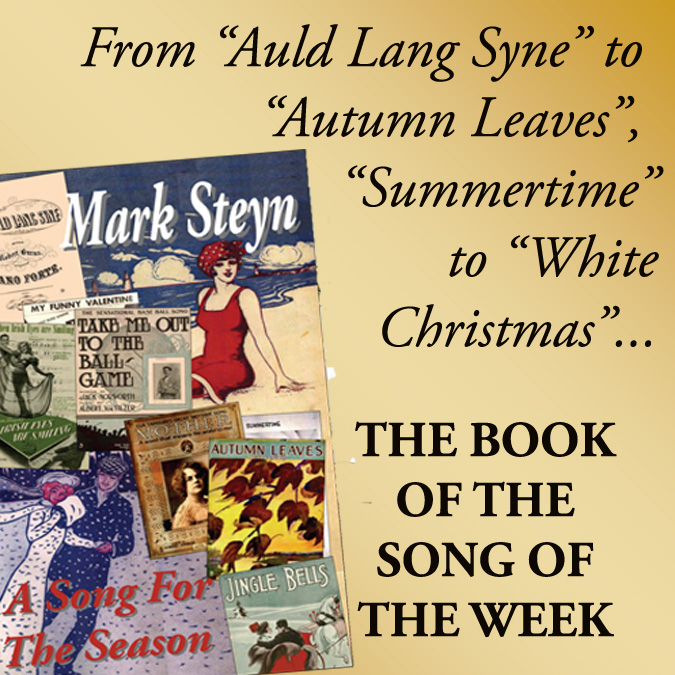 Join me for some twentieth-anniversary reminiscences starting on Monday. ~For our Massachusetts readers, next weekend - 3pm on Sunday October 28th - I'll be at the Boston Marriott in Newton to accept the Genesis Award from CJUI (Christians and Jews United for Israel). Aside from speaking, I'll also be signing copies of Lights Out - so it should be a fun afternoon, and if you're in the vicinity of Greater Boston we hope to see you there. As for this weekend, I'll be back later with our Saturday movie date, followed by some more live music for our continuing Bobby Troup centenary celebrations. 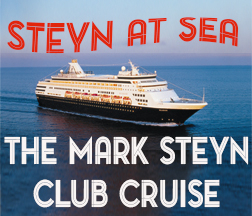 If you're not yet a member of The Mark Steyn Club, we'd love to have you. 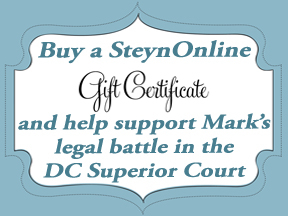 Alternatively, if you've a friend who'd appreciate the gift of Steyn, we've introduced a special Mark Steyn Club Gift Membership that lets you sign up a chum for the Club. 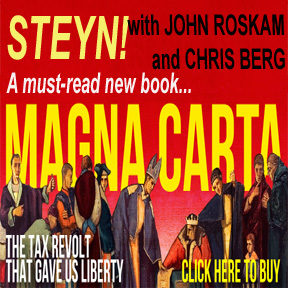 You'll find more details here - and don't forget, over at the Steyn store, our Steynamite Specials on books and much more. A bit off topic, but I thought Mark might be interested in this: NPR reported on Friday that a New Hampshire pancake restaurant has benefitted from climate change. The owner of the restaurant feels that the fall foliage season has somehow been extended, thereby increasing the number of his customers. I was up in NH the last week of September and the leaves had barely begun to turn, so the season my well be extended this year, but the connection to climate issues seems rather tenuous. Anything to advance the narrative, I guess. "Canada's 'niceness' has always been somewhat coercive." "It's no longer enough to be tolerant, to be blithely indifferent, warily accepting, detachedly libertarian... For tolerance is, by definition, somewhat grudging." Absolutely nailed it! Tolerance and "respect" are now (deliberately) used interchangeably. But "respect", as it is now understood, is compelled tolerance. Enforced tolerance. Tolerance is all that I'm prepared to extend (freely), and it's also all that I ask in return. I neither expect nor want "respect" from fellow citizens. I do not "respect" Islam— I am genuinely offended by it— but I would be (hypothetically) prepared to tolerate it in an attenuated and very benign form, the issue being that Islam does not tolerate unbelievers as a central tenet of the ideology. Live-and-let-live; the rough-and-tumble of a free, pluralist society... these are premised upon grudging tolerance, not codified, coerced "respect". This ties in with a basic premise of the Left. They believe that they can force someone to give, and that it's morally the proper thing to do. Simply put, you cannot force someone to give, that's actually called taking. This ties into your comment because basically the Left's intent is to force people to 'give' respect and that is a contradiction in terms. Both of these examples illustrate the core of the Left; they take ethical shortcuts out of fear, and they cannot tolerate those who don't because to do so would expose their inadequacies. I could expound further but my beer is getting warm and my pizza is getting cold, neither of which is good. Well said. It's why no government at any level should have any involvement in charity. Charity does not exist if there is coercion. Every act of government charity begins with a theft, and no good can ever arise from evil. "...they take ethical shortcuts out of fear..."
You're too generous to the Left! They take ethical shortcuts because they operate in an ethical vacuum, and (like Islam) the use fear to command "respect", in a quest for total power (and total submission). "Taking" "respect" (as you note) also fosters resentment, because it's conscripting *you* to *my* (state approved) viewpoint/ ideology. It approximates thought control. They want you to repeat the lie, as Mark once said. "It has never been hard to tell the difference between a Scotsman with a grievance and a ray of sunshine." As wide ranging as this post is, I believe it gives me the opportunity to float a theory of mine without being too off topic. My theory is that sitcoms are the root of all evil. Bear with me as it relates to both Democrat's strategy and Elizabeth Warren. This past week I was doing research on my theory by watching reruns of old sitcoms. Two episodes of "Grounded for Life" were most interesting. In the first, Lily, the teenaged daughter, was mad at her boyfriend, Brad, so she decided to run against him for class president. Brad is the nerdy type who was conversant with all the facts, figures, and issues affecting the school. Lily is not. In a debate, after Brad describes his brilliant plan to make the cafeteria better, the moderator turns to Lily for her thoughts. She blurts out "Brad is a racist!" Now this episode was from 2004. Just a couple of episodes later, Brad and Lily have made up and he has been accepted at Yale. Wanting to follow him but having no chance of being accepted at Yale, what strategy do you think Lily came up with? That's right, she claims to be Native American. She even shows up with her hair in braids, a headband, fringe leather jacket, and tells the interviewer, "I'm interested in all types of dance: ballroom, tap, jazz, rain...."
I submit that the strategizing of the Democrats today seems to have been derived from watching "Grounded for Life". Now I'm off to do more research. An interesting comment was made by the Pathology expert of the team that dealt with Khashoggi that he always advises for anyone to wear headphones and listen to music during such procedure. It seems that in Saudi kingdom ocasional procedure for post mortem is to do it while the corpse is very much alive. It is really disappointing that with Khashoggi affair that was the best story that they could come up with. It shows that their literally skills suddenly evaporated in thin air same as Khashoggi . In the past Arabs had enormous talent to come up with believable fantastic stories such as the Arabian nights, even recently they swear that Israel is committing genocide while the number of Palestinians in what was Palestine has grown exponentially, or any terrorist atrocity is committed because the perpetrator was insane. Then the real whale story that islam is religion of peace and all what is written in the Koran is misunderstood and misinterpreted by evil doers from its real meaning. Just listen to all the infidels such as GWB, or McMaster, or Obama (if he is infidel) or any democrat that that can get close to a microphone declare with out blush that this is the truth the only truth and nothing but the truth. I wonder if we will ever know why the Saudis knocked off JK? Why do it in their embassy instead of a back alley or hotel room? Why are the Turks so keen to embarrass them? Why is the old media still pretending he was a journalist? Just incompetence even in the consulate they could have done a cleaner deniable hit job. I shed no tears for Khashoggi. He's collateral damage as Iran's and Turkey's minion, and agent of the Muslim Brotherhood. Don't look a gift horse in the mouth. Too many US soldiers died because of the likes of him. The Washington Post should pick its "reporters" more carefully. I agree with you except on one point. I believe that WaPo did pick him carefully and that he was a 'journalist' and not a reporter. Earlier this year I had a brief correspondence with Lord Black about the difference between the two and suggested that news organizations go back to hiring reporters rather than journalists. In my view, a reporter reports what happens while a journalist editorializes the same. As for the rest of what you've said it's perfectly reasonable in my view and related to what I've been writing on here over the last week. MBS is undertaking reforms in the Kingdom and there are a lot of entrenched hard liners that want to put a stop to that and continue backing terrorists both financially and culturally. He's made it clear that he's the one calling the shots and his initial round of detentions in a five star hotel made a difference, though clearly Khashoggi and his allies didn't get the memo. On that note, Khashoggi is certainly only the tip of a much larger iceberg but perhaps it's one that will break up a bit more now, much to the dismay of the WaPo and the Left in general. The Mossad has removed many adversaries from the board and probably saved countless lives by doing so, and the same has happened time and again with most nations when they are at war either internally or externally. 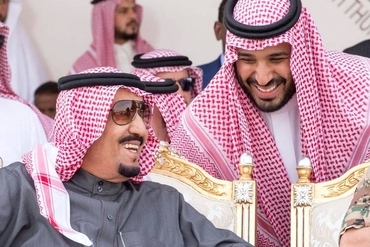 MBS can give no quarter if he wants to hold the empty one, or the hard liners may very well take the Kingdom into civil war to prevent reform. Cultural change doesn't happen overnight unless it crosses a society's border en mass. I concede your excellent point, Tom. And the ribbon you used to tie a bow around it - the Mossad analogy hadn't even occurred to me. Israel with Mossad, the US with drone strikes, the UK and France with wet work squads, Afghanada with Little Fidel; every country has its lethal weapon, though the last one on the list is lethal to its own country. With the Khashoggi incident the Saudis have shown all the other global players what it really means to strike with surgical precision. All on their own sovereign soil, outside the jurisdiction of Turkey. That part alone was brilliant, at least on paper. I agree that it was brilliant. However, Turkey wants to paint him as an American journalist so that they can pressure President Trump into coming down hard on Saudi Arabia. The journalist angle was probably unexpected by Saudi Arabia because they probably didn't see him that way at all, and rightfully so. It would be like Bin Laden writing a column on Al Jazeera and then being called a journalist and being given world wide protection as a member of the press. The Left is going to continue to use this narrative to try to damage President Trump in the runup to the election. As usual, some of the GOP have done a Jeff Flake and taken the bait instead of pushing back on the journalist claims and calling him what he is. Now it's up to President Trump to do that on his own, as usual. What a sorry excuse for a party. 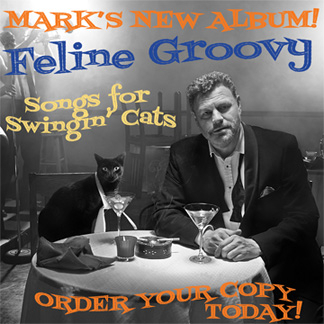 How time flies since I first discovered you, Mark. My National Post charter subscriber commemorative lucite paperweight still rests somewhere among my souvenirs. If this is not possible, send me your mailing address to [email protected] and I will mail you said novel. "Canada's famous 'tolerance' has become progressively intolerant." I wasn't aware of the movement on the Left at the time, but in 1998 was the term 'Progressive' used as a handle for the Left like it is now? I'm just curious as to weather this was just a turn of a normal phrase or if it was an inadvertent bit of prophesy? Great bits of writing from back then by the way. I expect that all of the bits were but only bits of this one bit are shown here, which might make it an itty-bitty-bit. As for the Saudi affair, it doesn't ruffle my feathers at all. There's an old Chinese proverb that goes something like 'If you ride the tiger be prepared to wind up inside.' 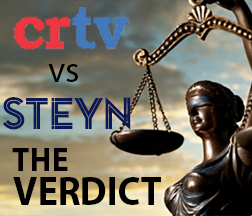 As Mr. Steyn wrote earlier this week, the perpetrated was hardly an innocent. What I've been really interested in all along is Turkey's role and motive in all of this. 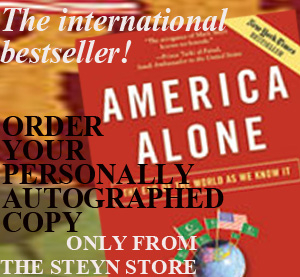 They've been doing a full-court press in the Western media and even played a major card by releasing a US hostage all in an attempt to break the alliance between the US and the Saudis. That might be their only goal with all of this but I wonder if there wasn't something else going on. As I wrote on here earlier this week the Saudis wouldn't undertake this kind of political risk without a substantial reason so perhaps there were family or military secrets that were threatened to be disclosed. I suspect that the Turks had plans and that this incident derailed those plans and that's why they pushed it internationally as hard as they did. Erdogan wouldn't give a damn about what happened to any 'journalist' unless he had specific value to Turkey's strategy and I'd say it was that value that made him a threat to the Saudis. "the thing about diversity is the ruthless uniformity with which it is applied" - too bloody true! I wonder if Ford for instance would be forced to take part in a Gay Parade even if he objects to police not being allowed to march in it? I imagine every American whose family has been in America over a century has a bit of coal in the woodshed somewhere. Some time ago there was an item in "Science News" as I recall about a mix-up of babies in a hospital which required DNA testing of a large sample to straighten things out. Two interesting discoveries came of this. The first was discovery of a mosaic (the mother of the mis-identified baby was a mosaic which led to complete chaos in trying to ID babies). Second, there was the discovery that a very significant fraction of the babies had a father different than the mother claimed. I'll not comment further about this other than to say, your point is probably very true. In unrelated news, the razor thin Liberal majority in Oz is no more due to a by-election loss to an independent. So the story of the Liberal leadership circular firing squad continues. It seems the Saudis aren't the sinister geniuses we were supposed to believe them to be. 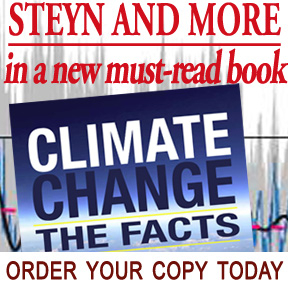 Surely, it would have been far more effective to just pull a Sargent Shultz (of Hogan's Heroes), "I see nothing! I know nothing! "—and stick to it! Mark, thanks to the copy layout of your column today, the opening topic gave me a good laugh about a not so laughable subject. Scrolling as I was reading, "... a chap such as Jamal Khashoggi, a deep-cover spook and former confidant of the highly sinister Prince Turki, does not get whacked except on orders from the very highest in the land. By "very highest", see the two fellows at right." 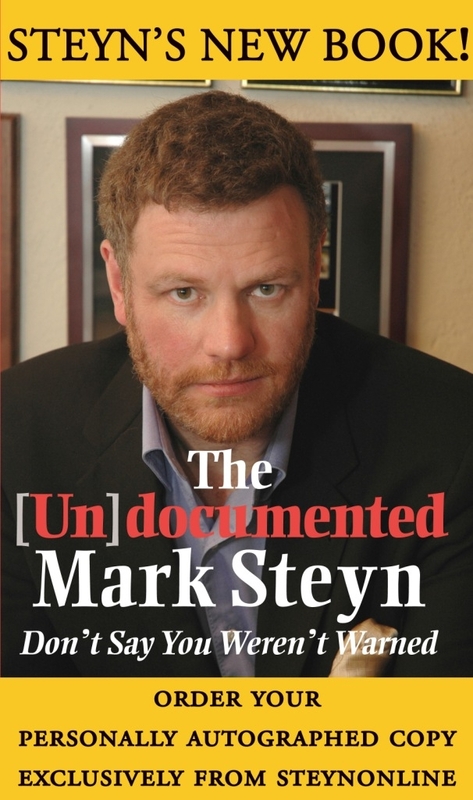 So I look to the right to see just who those two fellows are that are "the very highest in the land", and who do I see but none other than the two smiling faces of Dennis Miller and Mark Steyn! Congratulations to you and Dennis on your galactic rise to such powerful heights! No doubt the Saudis will be happy to pin Khashoggi's murder on you two! Twenty years later we have Canada's federal government denying summer jobs grants to applicants who refuse to sign-on to state ideology concerning abortion and homosexuality. In Canada, we Celebrate Conformity! Now they've admitted he's dead, don't they have the small problem of producing a corpse? All the king's camels and all his hit men can't put Khashoggi together again. Apparently, we didn't with Bin Laden. And good riddance to both.